Proper Orthogonal Decomposition Methods for Partial Differential Equations evaluates the potential applications of POD reduced-order numerical methods in increasing computational efficiency, decreasing calculating load and alleviating the accumulation of truncation error in the computational process. Introduces the foundations of finite-differences, finite-elements and finite-volume-elements. Models of time-dependent PDEs are presented, with detailed numerical procedures, implementation and error analysis. Output numerical data are plotted in graphics and compared using standard traditional methods. These models contain parabolic, hyperbolic and nonlinear systems of PDEs, suitable for the user to learn and adapt methods to their own R&D problems. Zhendong Luo is Professor of Mathematics at North China Electric Power University, Beijing, China. Luo is heavily involved in the areas of Optimizing Numerical Methods of PDEs; Finite Element Methods; Finite Difference Scheme; Finite Volume Element Methods; Spectral-Finite Methods; and Computational Fluid Dynamics. 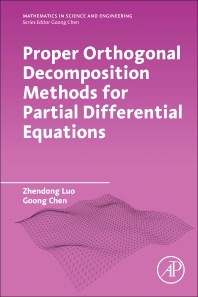 For the last 12 years, Luo has worked mainly on Reduced Order Numerical Methods based on Proper Orthogonal Decomposition Technique for Time Dependent Partial Differential Equations.